In this video we will discuss Row_Number function in SQL Server. This is continuation to Part 108. Please watch Part 108 from SQL Server tutorial before proceeding. 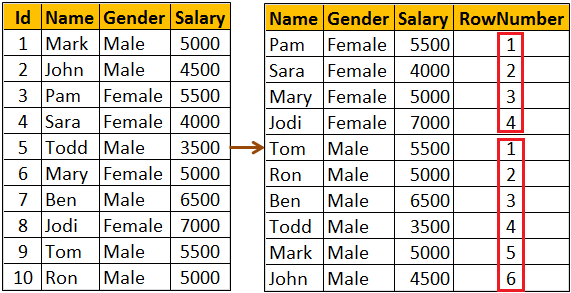 Row_Number function without PARTITION BY : In this example, data is not partitioned, so ROW_NUMBER will provide a consecutive numbering for all the rows in the table based on the order of rows imposed by the ORDER BY clause. 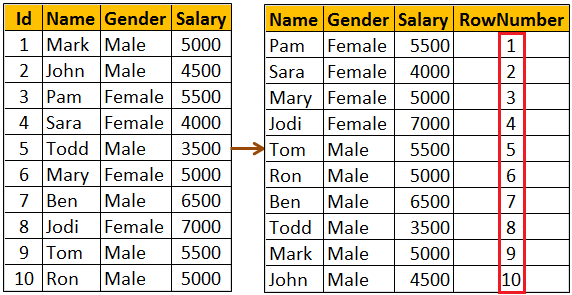 Row_Number function with PARTITION BY : In this example, data is partitioned by Gender, so ROW_NUMBER will provide a consecutive numbering only for the rows with in a parttion. When the partition changes the row number is reset to 1. Use case for Row_Number function : Deleting all duplicate rows except one from a sql server table. Discussed in detail in Part 4 of SQL Server Interview Questions and Answers video series.